Click here for links to trail rides in the South Island. Click here for links to trail rides in the North Island. The Waitemata Motorcycle Club Inc has been organising motorcycle competition and trail riding since 1972. Originally an offshoot of the North Shore Motorcycle Club it became its own stand alone club in 1978. The club's headquarters are in Riverhead Forest near Auckland and it is here and nearby Woodhill Forest that most trail rides are held, though the two venues could not be more different. Riverhead Forest is clay-based ground with steep ridges and swampy gullies, making this forest very challenging riding in the winte months. Woodhill Forest is made up entirely of sand on old coastal dunes. The venue is enjoyed best in winter when the sand tracks are firmer. 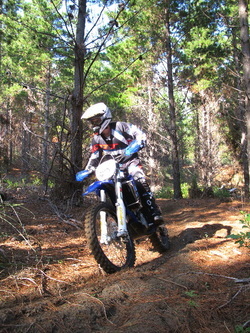 Power Adventures is run by former Trials Champion and Enduro racer turned events organiser. 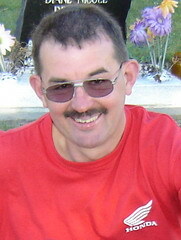 Greg organises a prolific number of Honda-backed off road events of all types ranging from cross country races to trail rides, enduros and kids specific events. Many of the rides are organised in Maramarua Forest just south of the Bombay Hills. Started by cross country racer Nick Reader Epic Events have been organising trail rides and race events in the Taupo since 2000.. 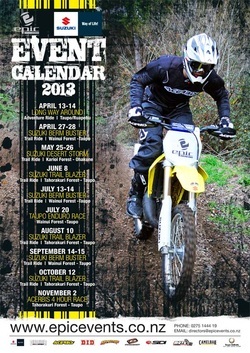 Rides include the Bermbuster and Trail Blazer and Desert Storm trail rides plus enduro and cross country races. At the end of 2011, Epic Events changed ownership, with Nick handing over the reins to Gordon Sandilands and Claire Bullock . New initiatives include adventure riding and rider coaching. One of NZ's long-standing off road clubs the Tarawera trail Bike Riders organise a full season of rides near Kawerau in the Matahina Forest. In addition the club holds the annual Tarawera 100 cross country race, once again one of NZ's longest running races of its kind. Karamu Trail Track was originally an off-road trail bike track open once a month to the public from the mid 1980's until the mid 1990’s. In response to demand the tracks was opened again in 2006. Beginner riders and children are welcome and will enjoy the specially designed novice track and like the advanced riders will be able to enjoy some challenging terrain.